Whether you’re an all-star athlete or a casual exercise enthusiast, everyone has their own pre and post-workout ritual that makes them feel their best. From refueling with a smoothie after a run to that tea you sip before hitting a yoga class, there’s something for everyone. But have you ever thought about introducing cannabis into that routine? The effects of cannabis on the body and mind may vary from strain to strain and product to product, but one thing remains the same: marijuana has found its way into the fitness market. Cannabis—and edibles, specifically—is slowly becoming an accompaniment to exercise for both professional and recreational athletes. And if you are a marijuana consumer, it’s easy to see why. Imagine you are on a long run, surrounded by the same seemingly endless scenes. Your mind grows bored and your body begins to waver. And then it kicks in: the edible you ingested at the beginning of your run. Suddenly, you’re back in the zone, at peace, and ready to conquer more miles. This is the effect that marijuana can have, and is just one of the reasons as to why edibles have become more prevalent amongst ultra-marathoners, professional skiers, and so many others. But before you go on and introduce edibles into your workout routine, there are some things you need to know. With such a wide variety of cannabis products in the market, you may be asking: why edibles? While there are countless options when it comes to consuming marijuana, edibles provide an athlete-friendly solution over, say, smoking. Additionally, they often contain psychoactive, performance-benefitting effects not found in relief-oriented post-workout products such as balms and patches. When cannabis is ingested, its chemical compounds—cannabinoids—bind to receptors in the brain and body that regulate pain, mood, appetite, and memory, among other functions. Just as endorphins push you to go harder at the gym or on the field, endocannabinoids can do the same. Weed helps you tolerate discomfort, giving you the push you need to get through those last few reps or steps. It has the power to relax you, which is optimal for more meditative exercises. Cannabis can help you increase your speed, reduce performance anxiety, and even get you into flow state—the state of consciousness in which you are so immersed in what you’re doing that you feel energized and hyper-aware of your body and the environment. It’s important to note that while there is no definitive science backing up or refuting claims, there are numerous personal anecdotes from athletes and yogis alike. And while it’s more about the psychological than the physiological, the positive effects of cannabis and its uses are numerous. Triathletes use cannabis to get in the zone and focus on impeccable form, NFL players use it off the field for pain-relief, and professional skiers and snowboarders say that weed helps with anxiety and overall performance. Once you’re on board with edibles, it comes down to choosing the right type. Sativa, indica, hybrid, and CBD-rich variants each offer their own benefits and effects when it comes to the edible-exercise game. Sativa-based edibles elicit more stimulating and uplifting effects than their indica counterparts, providing an energetic pre-run boost for some. Indica-oriented edibles are known for their relaxing and anxiety-reducing effects, which can help you fall asleep or dip deep into a meditative state. For those looking for something that offers the relaxing effects of indica as well as the uplifting effects of sativa, hybrids are for you. Hybrids fall in the middle of the sativa and indica spectrum, bringing out a little bit of both. CBD-rich products are known for their therapeutic effects and more minimal (to nonexistent) psychoactivity, working to decrease inflammation and pain as well as speed up healing and recovery. 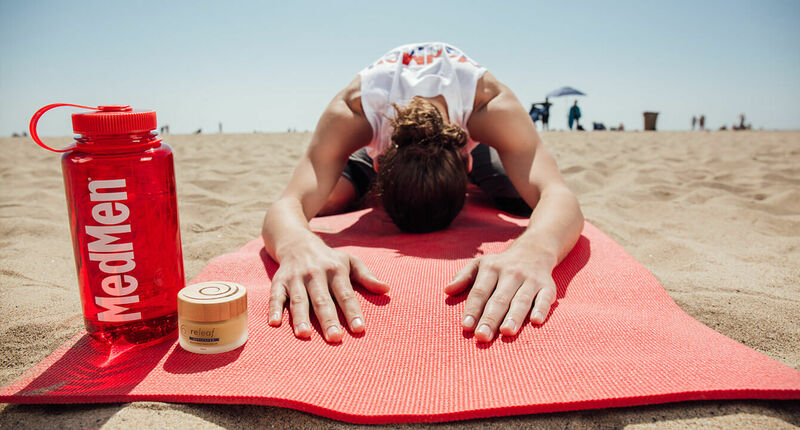 No matter which variant you choose or workout you default to, MedMen, a Los Angeles-based cannabis dispensary, offers a product perfect for you. As a trusted and leading force within the cannabis industry, MedMen is the destination for people who are looking to boost their game. From CBD gumdrops and sativa chocolates to local brands with a variety of offerings, MedMen has an edible for you. Learn more about MedMen and our locations here.